Remove Onion bitterness by simply using plain water.Can you re-call the sweet tasting raw red onions that you crave for while eating the delicious Nan with Chicken curry or Dal Makhani in Indian restaurants? If yes, then you have reached the right place. Remove Onion bitterness by sub-merging them in water before using in Salad. This is what restaurants in India do and get the sweet taste from red Onions. Take a bowl big enough to completely sub-merge Onions in water. 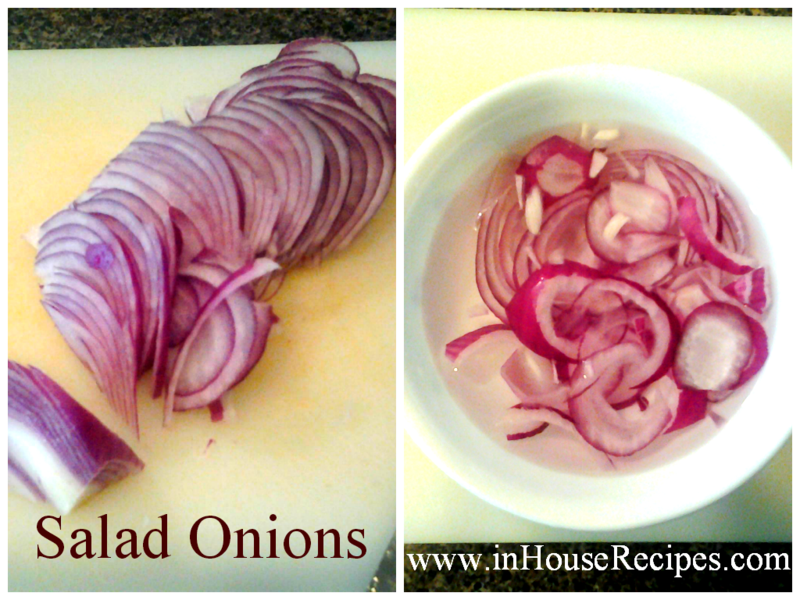 Now soak the Onions in water for about 30 minutes before serving. The water will steal away the bitterness. These Onions can be refrigerated up-to 2-3 days for best results. They are normally served as a salad accompanying Chole Bhature and other Indian meals. For your information, Vinegar Onions is a completely different type of salad. The one we have listed in this article is plain raw red Onion with no additives.